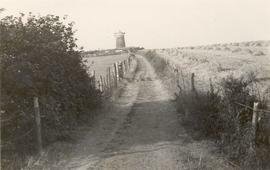 Black and white digital image showing Hildersham Windmill with no sails, in the background, viewed from a farm track. 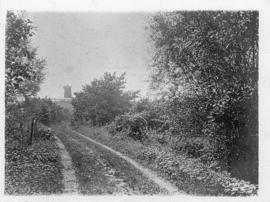 Black and white postcard of Hildersham Windmill with no sails, at the end of a dirt track. Black and white photograph of Hildersham Windmill, shown with no sails. The photograph comes from the Cambridgeshire Collection, as identified on the reverse. HESS catalogue #1268. This is the cap roof of the tower mill at Sporle, moved to Tottenhill post mill and set up as a shed. It was still there in 1998. Photograph of the top of Heapham Windmill, showing the cap and fan stage. Photograph of the cap of Mount Pleasant Mill. "New cap for West Winch windmill"
Article in the 'Eastern Daily Press' about the fitting of West Winch mill's new cap. "Windmill's new cap goes on"
Article from an unknown East Anglian paper dated around August 1979 about the installation of the new cap on Great Bircham Tower Mill under the guidance of the millwright John Lawn.